This perception wasn’t just built on hope value: The core HTEC division was an obvious jewel in the crown, a new management team was already delivering on its promises, and (if necessary) the shareholder register promised potential activist intervention. The company’s substantial undervaluation was obvious – and its evolution from manufacturing & product sales to a software/transaction solutions provider, focused on increasing recurring revenues, promised significant intrinsic value upside potential in the future. Based on the company’s metrics at the time (adjusted for somewhat excessive debt), I pegged Fair Value at 8.4p per share. I also predicted its loss-making CEM unit would be closed down, or sold – contingent on that, I suggested a Secondary Fair Value of 11.0p per share was also possible. As expected, the CEM unit was sold in Dec-2012, followed by two strategic bolt-on acquisitions (Indigo & RST) in 2013. A new & updated product offering was completed in 2012 & enjoyed a very successful 2013 customer roll-out. Revenue reached a H2-2013 run-rate of GBP 18.6 M, vs. continuing ops. revenue of 10.5 M in 2011. And with the turn-around complete, the CEO Stephen McLeod departed in Sep-2013 to pursue other projects (Robert Goddard remains as Chairman) – to be replaced by Jeremy Lewis, an ex-investment banker & a technology/software company CFO/CEO for the past 15 years. The share price has also lived up to its potential – it’s now trading in excess of my price target, at 6.125p – that’s a 158% gain vs. my original write-up at 2.375p per share! In fact, the shares almost reached my original 8.4p fair value target, with a Nov-2013 high of 8.25p per share. 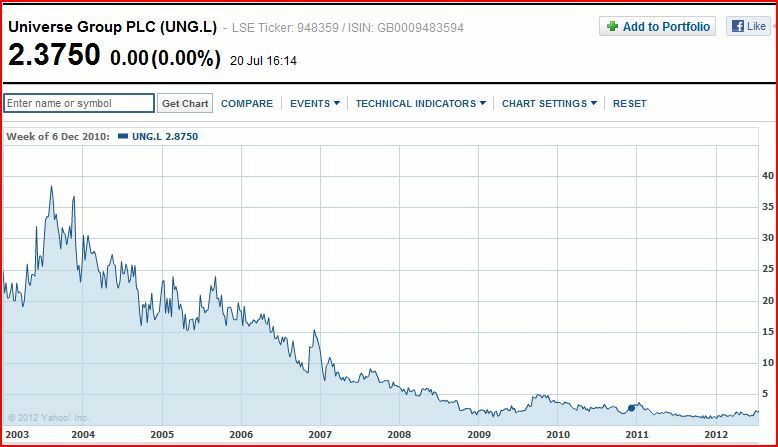 Which begs the obvious question – what’s an appropriate fair value target for UNG now? !